Playfield 2X or 3X multiplier combined with up to 6X power features multiplier. If I remember right my 267 million was from a 6X 22m jackpot with double playfield scoring running. I chickened out on pushing it up to 3x playfield. That must not have included Tomb Award 3, which would have given you another 240m. So if you do that with 3X playfield we have a max 33X multiplier? I think it would be 36X based on that info but I don’t know the actual limits. I’ll probably never do it, but knowing that it’s possible to get a 33X (or 36x) power jackpot is just one of many things that keeps me interested in this game! 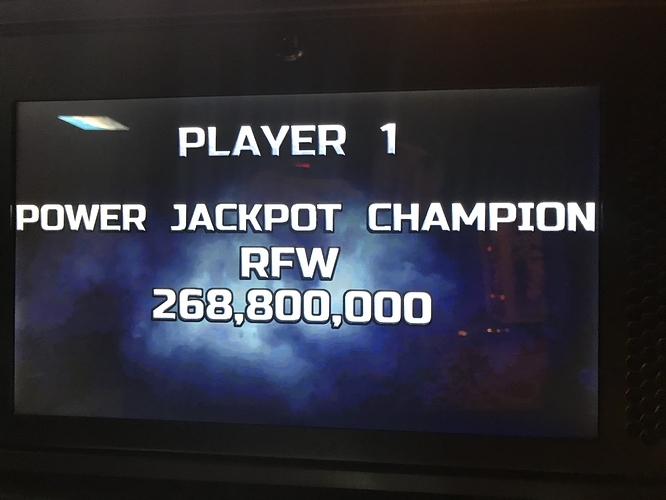 The true Billion point shot. Maybe I’m wrong. I really thought there were other ways. There is a secret skill shot that also bumps the multiplier. I’d be interested to see how many people out there have achieved and documented (video/pics) Run To The Hills final wizard mode. Not bad ehh! Just getting tomb award 3 (15million) stacked with triple playfield and 6x will get you a cool 288 million… At least on the Pro. Does the Premium still default to “CIPWM” for that tomb award? Anyone actually know where the skillshot is for the PJP multiplier? I’ve experimented a bit but I’ve never been able to find it (I think it must be one of the full plunge skill shots since the full plunge isn’t very reliable on my machine so I can’t really go for those skill shots). Hold left flipper, full plunge around big loop, hit orb. I used this as my bailout if I over plunge the normal super skill shot. I’m going to have a glass-off experiment to see what the theoretical max PJP can be. Any guesses as to what final value will be? Keep in mind the pharaoh award also adds to the power jackpot (knock down drops and shoot bullseye target) so there is no max award per say just multiplier. Seems to me that you can do one or the other, but not both. If you get the SSSS multiplier it’s just going to be wiped when you shoot the orb for mystery awards. If the PJP isn’t yet qualified (by completing the required no. of shots) it can’t be collected - can it? Not sure. That’s some territory I’ve never really paid attention to. I’ve just done a run though. Couldn’t find boost PJP multiplier from mystery, in any level - only boosts. 1m, 3m & 6m. Didnt want to spam the mystery or pharoh targets to boost the base value before collecting. A 900mil Superdeathblow is also possible! Agreed that you dont need to have completed a set for it to light the ‘normal’ way, making 39x collect impossible.